What's a Good Contractor Worth? Let’s face it: there are too many people out there who call themselves “contractors” but who aren’t true professionals. This makes it harder on homeowners, because you can’t simply trust everyone who says they can service your comfort system. Truly professional contractors care about your home’s indoor environment system, because they care about your business … and they want your referrals. True professionals offer employee training, provide state of the art safety equipment, ask you questions about your lifestyle needs, and provide options for service, so you can make the right decision. This short video explains what a good contractor is really worth. Choosing the right contractor means asking the right questions. This short video explains the basic questions you should always ask, and what the answers should be! Are your technicians NATE certified? NATE certification is the industry’s standard for technician excellence. You should never accept anything less. Do you offer continuing education to your employees? This industry changes rapidly. Ask the contractor to describe their training program. Can you provide local references? Get the names of neighbors who have used the company’s services, and then follow up with them. Do you offer a service agreement plan? Well-maintained equipment runs more efficiently and lasts longer. Are you properly licensed? Unfortunately, every state, city, or county could have different contractor licensing rules. Ask for proof! Do you follow the industry standards? Make sure your contractor knows what “Manual J” and “Quality Installation” are, just for a start. Scroll down on this page to find out what these standards are and why they are important to you! Your heating and air conditoning system is a complex mechanical system. Properly installing and maintaining them is not an easy thing to do. It requires education as well as skill. Too often, homeowners feel rushed by “contractors” who prefer to keep the process as mysterious as possible, because it benefits them. ACCA wants to take the mystery out, and focus the benefit where it belongs … on you! Watch our free video, “A Guide for Home Heating & Air Conditioning Service,” for a full explanation of how to choose the right contractor, and what to expect from a professional contractor when they come to your home. You should start here at ACCA, and that means you will find a contractor who has shown through membership that they are committed to regular education and quality standards. But that’s not where you should stop. Ask your neighbors for referrals. Have they worked with a contractor before? Was the experience good or bad? We still think neighbors are a great source of information for homeowners everywhere. We all read online reviews, but don’t rely solely on them.We all use online reviews for everything nowadays, from books to baby bottles! But we’ve also all learned that online reviews can be “gamed” either positively or negatively. You can start with online reviews, but take them for what they’re worth. We still believe talking to neighbors can teach you more about a contractor’s service than an online review. Also, be careful of online contractor services that claim to be able to put you in touch with licensed contractors. Most of these services make their money by charging contractors for “leads,” and most of the best contractors in your area won’t participate in them. Once you’ve narrowed down your list, contact the contractors and invite them to your house to discuss your system and your options. This is where, armed with the information we’ve provided you above on this page, you can ask the right questions and learn more about your contractor. You’ll need this information to make the right choice. Does this sound like a lot of work? Sorry, but yeah, it probably does. There’s no quick and easy way to this decision. It’s too easy in most states to simply call yourself a “contractor” and start soliciting business, even if you’re not particularly qualified and don’t know how to run a contracting business. That’s why we strongly recommend that you find the right contractor and develop a relationship with their company before something goes wrong. When your system breaks down in extreme weather, your first priority will be to get the system working as quickly as possible for your family’s comfort. This is when you can wind up spending a lot more money than you might want to. Admit it: You probably don’t think about your indoor comfort system until it stops working and you become either too cold or too hot. It’s human nature to put something in the back of your mind as long as it doesn’t cause a problem and stays in the background. And you might think of your heating and cooling system as just a “box” that can be turned on or off in order to control your temperature. But your system is a lot more than that. It doesn’t just control temperature. It has an impact on the air that you breathe, on moisture and mold growth, the amount of energy that you use and money that you spend, and most importantly, on you and your family’s health. 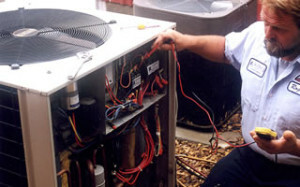 Don’t ignore your heating and cooling system. Your HVACR system is a great big mechanical system, just like your automobile. You know that you need to keep your car tuned up and get your oil changed regularly. Your comfort system also requires regular maintenance from qualified specialists. Ignoring your comfort system means it will break down more, need replacement sooner, cost you more money throughout its shortened lifespan, and it might impact your health. There is one piece of “jargon” that you should make sure you hear. If you are installing a replacement system, make sure you ask your contractor about Manual J®. Manual J is an industry standard that describes a method for determining, basically, how “big” your air conditioning system should be for the size and type of house you live in. It’s required by most building codes nationwide, because only Manual J offers the precise determination of system size needed to ensure that your system lasts longer, operates efficiently, and actually makes you comfortable. If your contractor says that a Manual J isn’t needed for your system replacement — even if that contractor is a member of ACCA — you should find another contractor. Full system replacements always require Manual J as a fundamental step toward quality installation. When so-called contractors say, “Oh, your home is X square feet, so you need a X-ton unit,” you should tread very carefully! This “rule of thumb” is always wildly inaccurate. It results in the installation of systems that are often too big for your actual needs. When a system is too big, it results in discomfort — because the system can’t remove moisture from the air properly. It results in systems that work too hard — and cost too much money — and die early deaths! That’s a lot of money out of your pocket for a system that doesn’t even make you feel comfortable. Manual J® is important, but it’s just the first step toward “Quality Installation,” or QI. 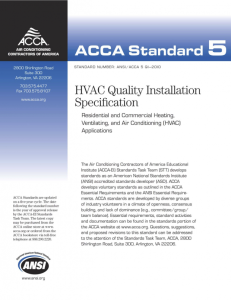 QI isn’t just a generic term — it actually refers to a very specific standard, the ANSI/ACCA Quality Installation Specification, whichdetails all the steps that a contractor must take to ensure that a heating and air conditioning system is properly installed for the highest possible quality. QI is a rigorous process, but when a contractor follows all of the steps of QI, the homeowner is ensured that the system has been designed and installed in a manner that ensures the unit’sbest possible functioning, at the lowest possible operating cost. So while QI may look more expensive at the outset, it actually provides the most value for your dollar. To help you evaluate contractors who commit to QI against those who don’t, we’ve created a special checklist that you can use to “score” the contractors competing for your business. NATE is a voluntary certification program designed to ensure that qualifying technicians have a core set of competencies and can be trusted by the consumers who hire them. NATE is the culmination of several years worth of work by the entire indoor environment industry to establish a meaningful nationwide certification. Over the past few years, NATE has grown considerably. Over 30,000 technicians have been NATE-certified and the list continues to grow. NATE certification is the standard by which all other technicians should be judged, and it’s the only technician certification that matters! There are other third-party certification programs out there, but NATE actually has the lowest “pass” rate, and is the only nationwide certification program that is endorsed by the HVACR industry across all levels. Technicians, contractors, manufacturers, utilities, educators, wholesalers, and leading industry trade associations support NATE. Studies show that NATE-certified technicians have fewer “callbacks” than non-certified technicians. What does this mean? It means NATE-certified technicians get it right the first time.